The state of Florida is having a sales tax holiday for school supplies up to $15 per item from August 1-3. States typically define School Supply as "any item normally used by students in a standard classroom for educational purposes." Because school supply items are included in this sales tax holiday, the list of items below will be state tax-free during the holiday period. Please note that you must place your order with Stampin’ Up!® during the tax holiday period in order to receive these items tax-free. Also, keep in mind that this is a state sales tax holiday and may not apply to additional county, city and special jurisdiction taxes. This limited-time benefit! The following items are tax-exempt during the Florida sales tax holiday: Friday- Sunday On line HERE or through me. Let me know if you have any questions, it is a great time to stock up. Labels: Florida Tax Free Weekend, Frances Wagner, Stampin' Up! 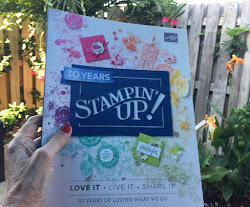 Weekly Deals - 7/29/14 Stampin' UP! CHECK OUT THE NEW WEEKLY DEALS HERE! Starts today, prices are good through Monday 8/4/14 11:50 pm Mountain Time. Have you noticed the Mustache Framlit on page 230? What fun to play with. I had this sign on my table last week at the Salvation Army Crop. I had the sign up sheet next to it for next months class. For those that signed up I gave them one of these cute mustache on a straw. I did give several away to the scrappers that have children but they are so darn cute for all ages. What a cute party favor. So many possibilities. Let me know if you need more party ideas! Labels: Frances Wagner, Mustache Fun, Stampin' Up! Last weekend at the Salvation Army Crop I gathered my friends that had purchased My Paper Pumpkin this month and we had a party. What fun to open the beautiful Orange boxes and see what we had in store. I invited Andrea who was in my morning class to join us and give it a try. These are the samples we made from the directions and now that we have that under our belt we will be exploring other possibilities. This is a party minus one. You can tell how much fun we were having! Join us next month when you purchase your own paper pumpkin. This is a great time to sign up 50% off! If you do not have a demonstrator I would appreciate it if you choose me as your demonstrator for My Paper Pumpkin. 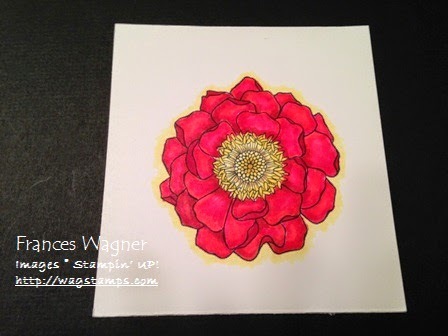 Labels: Frances Wagner, My Paper Pumpkin, Stampin' Up! Last weekend at the Salvation Army Crop I had a class using the new Espresso 6x8 Project Life Album. What a fun time we had. It is so versatile and I know you will find many uses for it. We added chevron ribbon each person got to choose their own color. When I decide what I will use the scrapbook for I will stamp words on the front. I cased (copy and share everything) this cute idea from Janet Wakeland. She used other ribbon but the dots inspired me. So far I am using it for various ideas but will nail it down soon. This is from my Stampin' Bunco Group. I used MDS for my title. I love, love, love using Stampin' UP! Project Life products, it makes scrapping so much easier and quick. Thanks for stopping by! Let me know if you need help with your scrapping projects. 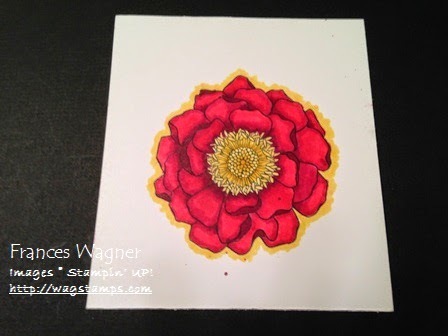 Weekly Deals 7/22/14- Stampin' UP! CHECK OUT THE NEW WEEKLY DEALS HERE! Starts today, prices are good through Monday 7/28/14 11:50 pm Mountain Time. Sign up HERE! Don't forget to choose me for your demonstrator if you do not already have a demonstrator. CHECK OUT THE NEW WEEKLY DEALS HERE! Starts today, prices are good through Monday 7/21/14 11:50 pm Mountain Time. 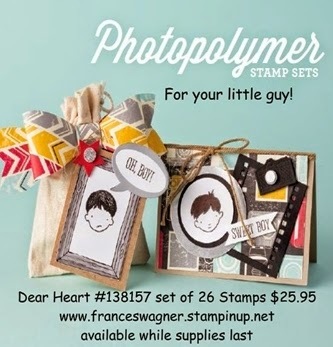 Dear Heart ~ Stampin' UP! Is this a sweet stamp set for your little guy or what. I have to have it for scrapbooking (YES) my adult children's memory books. So sad right, but no time like the present to get them started. Christmas in July - Stampin' UP! Christmas in July! You have the opportunity to purchase the Beauty of the Season Stamp Set--now available as a special sneak peek of the 2014 holiday catalog! I know this is going to be on my order this weekend. How about you. Labels: Beauty of the Season, Christmas in July, Frances Wagner, Stampin' Up! 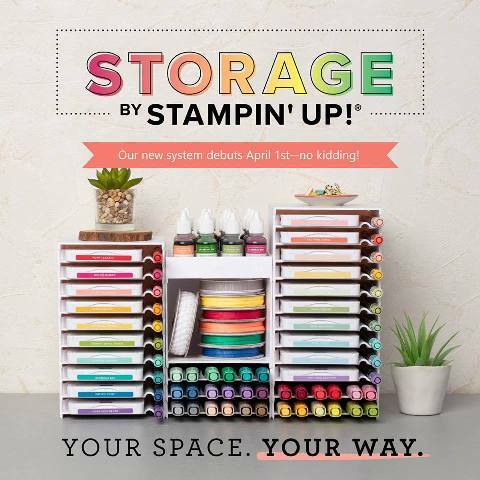 Weekly Deals 7/8/14 - Stampin' UP! Item # for product above. I will be placing an order on Saturday, let me know if you want to add to it with these products or the DSP Paper special buy 3 packs and get one free. If you want to order on line HERE use the hostess code 6HWVJNGJ and I will mail you a card as a little thank you! In the last year some of the girls I crop with have been raving about Copic Markers so I did an experiment that I want to share with you. 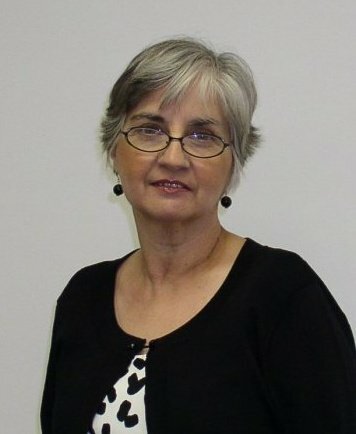 Below is Kelly Ingersol and she is one of the main scappers that use Copic Markers all the time at the Salvation Army Crops. So I stamped two identical images and I asked her if she would use the Copic Markers on one and the Blendabilities on the other! (funny story there she said well I have to stamp this again and I asked why? She said because I have to use Memento Black ink, I said that is what I used and Stampin’ UP! advises us to use and we sell it. :) Love that part when we surprise people. 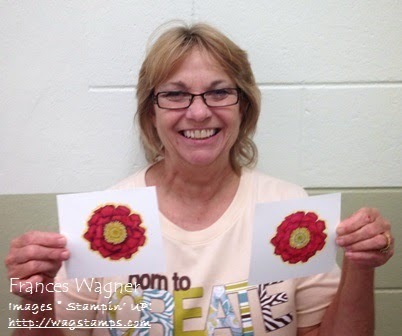 Check out the 2 samples below and choose which one you think is Stampin' UP! Blendabilities and which one is Copic Markers! Sample 1 is the Stampin' UP! Blendabilities! Thank you Kelly for making the samples for me. I love that you get 3 markers (light, medium and dark) in each package except for skin tones that have 6 markers for blending. Check out the video to see how it is done. SELECT STAMPIN’ BLENDABILITIES MARKERS NOW AVAILABLE! Alcohol ink markers made for blending and shading. Use with Memento Pad. Acid free, lignin free. 3 markers (light, medium, dark) per assortment except for the Skin Tone Assortment which includes 6 markers. BUY 3 AND GET 1 FREE!!!! This is the Stampin' UP! Special for the month of July. This is a great time to get those beautiful DSP packs of paper on page 186 and 187 of the new catalog. Don't forget the weekly deal!